We’re okay with the thought of living for Christ. That’s a comfortable thought. But what about dying for Him? Ouch…not so comfortable. But yet in order to truly live for Him, we MUST die for Him. It’s a matter of identity. 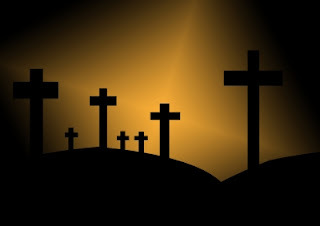 Until you can look to the cross and realize that it was your sins that ate at Christ like a cancer and caused His death, then you cannot identify with His purpose. It was the lies, the hurtful words, the repeated gossip, the evil thoughts, the things that you have kept hidden from everyone else – that was the root cause of Christ’s death. If they had done an autopsy, they would have found your sins to be the cause of death. YOU KILLED CHRIST. Once we can accept that truth, we can identify with Him the way Paul did when he said “I have been crucified with Christ”. The crucifixion wasn’t for Jesus. He didn’t need to die for Himself. We needed Him to die, to make us right with God by being that bridge of God and Man to fill the gap between us. “I have been crucified with Christ” means that you have given up life. What life? The life of your own self will. Paul goes on to say something about life instead of death when he says, “It is no longer I who live, but Christ lives in me”. This is a new identity. He’s let go of who he is in order to be who Christ says he is. He’s understanding that he is not his own, and his will is no longer his own. I’m certain Paul didn’t get up in the mornings and say “I have an ambition to write 13 books of the Bible and minister to people while being in jail until my death for doing God’s work, and I’m just tickled to have this thorn-in-the-side problem to live with.” Instead Paul allowed his faith in the Son of God, who LOVED HIM and GAVE HIMSELF FOR HIM to determine his every move. If the Holy Spirit said to go to Corinth, he went. If the Holy Spirit said to go to Pathos, he went. And wherever he was, he found contentment (Philippians 4:11) because he knew he was doing what the one that loved him most desired him to do. He was content because he was fulfilling his true purpose. When you understand the love Christ has for you by identifying with His death, you have no problem in following Him. Knowing that you have that kind of love from Christ will fuel your tank. There’s nothing you won’t do for someone so willing to do anything for you. So go ahead – let yourself go! Unshackle yourself from the old you that has died when you became new (2 Corinthians 5:17), and understand that YOU are a child filled with the Spirit of the Most High. You have worth in the sight of Almighty God. You have a plan written specifically for YOUR life, penned by the very hand of God. And it’s all because of Christ.